The conversion of this iconic American barn into a Writer’s Studio was conceived of as a tranquil retreat with natural light and lush views to stimulate inspiration for both husband and wife. Originally used as a garage with two horse stalls, the existing stick framed structure provided a loft with ideal space and orientation for a secluded studio. Signature barn features were maintained and enhanced such as horizontal siding, trim, large barn doors, cupola, roof overhangs, and framing. New features added to compliment the contextual significance and sustainability aspect of the project were reclaimed lumber from a razed barn used as flooring, driftwood retrieved from the shores of the Hudson River used for trim, and distressing / wearing new wood finishes creating an aged look. Along with the efforts for maintaining the historic character of the barn, modern elements were also incorporated into the design to provide a more current ensemble based on its new use. Elements such a light fixtures, window configurations, plumbing fixtures and appliances were all modernized to appropriately represent the present way of life. 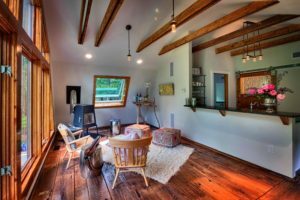 "We hired Hudson Design to renovate and redesign an old barn on our property. They did fabulous work. It is now essentially a one bedroom apartment, with room for cars and storage. The design work was perfect. They supervised the construction and I had no headaches at all. Everyone who goes into the barn is amazed by the use of the space. I highly, highly recommend them."